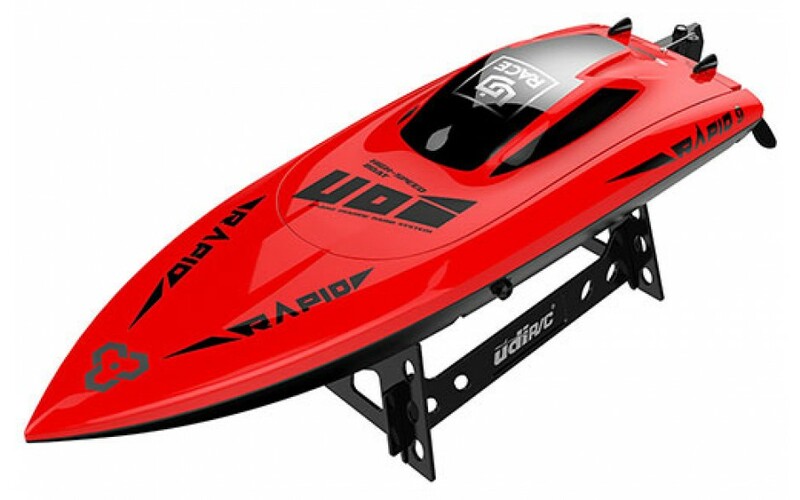 The UDI009 Rapid uses a powerful water cooled 390 class motor to achieve a impressive top speed of 30km/h. The hull is precision injection in strong plastic with a double canopy system to keep the electronics dry in the harshest of environments. The Rapid is supplied in RTR (Ready to Run) format meaning all of the electronics are all pre-installed and ready for you to use, all you need to do is charge the boat battery and add batteries to the controller (not included). The Rapid is supplied in RTR format using a high quality 2.4GHz marine radio system for nterference-free operation. The hull has been carefully designed for optimum water resistance. Under the top canopy hatch there is a second hatch with five locking catches and a foam seal forming a highly effective water barrier. Inside the boat generous amounts of sealant are used around the motor shaft and water pipes for a tight seal. The Rapid is powered by water cooled brushed 390 class motor allowing it to reach speeds of approximately 30km/h straight out of the box! The Rapid is supplied with a Li-Po battery for the best performance and duration. The 2x 3.7v format may seem unusual at first glance but it allows you to charge the battery using a 5V USB port with the included charger. The built-in telemetry will alert you when the boat battery is running low on power. The controller will emit a distinctive beeping noise as an alarm to and remind you to bring the Rapid back to land. If you operate the Rapid too far away causing the 2.4GHz signal to weaken then the controller will alert you to bring the boat closer to keep a strong signal.